To the uninitiated, it would appear that CAF struggle with the concept of picking suitable hosts. 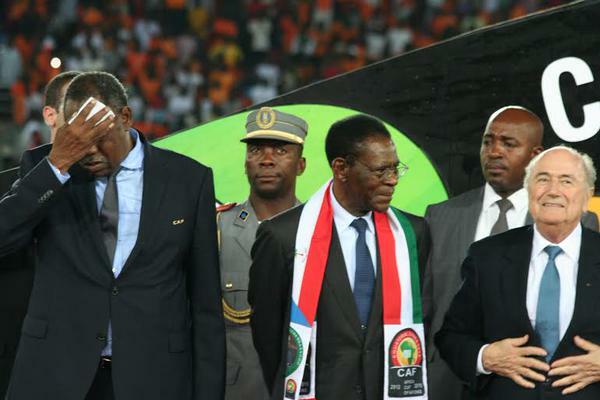 After the speedy shuffle of AFCON 2015 to Equatorial Guinea from the Ebola-fearing Morocco, the question of who will host AFCON 2017 is about to be answered, with the long-running saga due to end on the same day as the draw for the qualification process. Originally supposed to be hosted by South Africa, the subtle switcheroo between Libya and the South Africans went largely unnoticed, with the civil war in the North African country meaning that putting on a successful intracontinental tournament was the least of its worries. South Africa hosted in 2013 instead, allowing Libya four years to sort itself out. With security fears continuing, the hosting rights were fully rescinded by CAF in August 2014, as they reopened bidding to host the competition in two years time. Having already gone ahead and picked the hosts for 2019 (Cameroon), 2021 (Ivory Coast) and 2023 (Guinea), three countries made fresh, CAF compliant bids for the 2017 tournament, as CAF looks to avoid the bad bit of form its got itself into over the last few years. At SFG, we’ve taken a look at the good and the bad of each bid. Which ones are Aristide Bance and which ones are Kevin Prince-Boateng? Are they more Herve Renard’s white shirt or Avram Grant’s Primark polo? Here’s the lowdown on the potential hosts…. Background: Favourites for AFCON 2015, the Fennec Foxes ultimately failed to produce in Equatorial Guinea, knocked out in the quarterfinal by eventual champions Ivory Coast – in a tournament where nothing reflected pre-tournament expectations. The North Africans will be hoping that the awarding of a tournament they have been consistently involved in but rarely hosted will appease this disappointment. Winners back in 1990 when they took on the responsibility, the Maghreb giants are many people’s choice. Pros: In terms of football infrastructure, it is difficult to beat Algeria in terms of quality. A strong league with a long-established national team in the upper echelons of African football, the basic necessities to host a tournament are largely already there, with a sufficient number of cities capable of hosting to mean that one or two will almost certainly miss out. Indeed, a number of stadiums are already under construction in the country. The Grand Stade d’Alger in the capital Algiers is to open this year, with the Olympic Stadium of Oran – due to take the name of Algerian legend Abdelkader Freha – also due to be ready. Furthermore, they have a genuine footballing culture in the country, with some of the best atmospheres you’ll experience in Africa being located in Algeria. Whether it be bouncing Bilda when the national team come to play or going to see reigning CAF Champions League winners ES Setif play at the Stade 8 de Mai, going to see football here is a memorable experience, meaning that crowds should be high for most matches – even when Algeria themselves are not playing. Perhaps most importantly, they have the basic principles of sharing on their side. Having not hosted for 27 years by the time 2017 comes around, its essentially their turn, with their contenders for the rights having both hosted within the last decade. CAF has never been particularly good at sharing the hosting between regions of Africa, but do tend to try and ensure it’s not in the same place too regularly. Regional neighbours Egypt also trumped the Algerian bid, after pulling out of the running earlier this year. Cons: The big thing holding back Algeria’s bid is the death of Albert Ebosse last year. Whilst details of the Cameroonian forwards death are highly debateable, the initial reason for his death was being hit by a projectile, as angry JS Kabylie fans began to tear apart their own stadium. Analysis since suggested this may have not been the case, but the incident hit African football hard, and will not have done the bid any favours. Whilst the stadium has since been closed indefinitely, and security at national team games normally severely beefed up compared to domestic matches, it will no doubt be a consideration of CAF’s – with the possible awarding of the rights to Algeria something that is unlikely to create good publicity. Whilst football infrastructure in Algeria is excellent, the tourism infrastructure is less so. Morocco, Tunisia and Egypt may have jumped on the tourism bandwagon, but Algeria remain a relatively unknown quantity to many holidaymakers, with the lack of tourism reflecting in how easy it is to stay there. Clearly this cannot possibly be worse than the African North Korea – Equatorial Guinea – but will no doubt be a consideration. Likely host cities: Libreville (two stadia), Port-Gentil, Franceville. Background: New players in African football, both in terms of quality of football and willingness to invest in football, Gabon are the outside bet for many ahead of this draw – but could be closer to hosting it than you think. A growing destination on the map of European tourism, its putting itself out there and raising its profile, seemingly no longer willing to be the obscure nation on the west coast that it was before. A disappointing 2015 Cup of Nations in neighbouring Equatorial Guinea, as the tag of dark horses weighed them down and pushed them out at the group stage, the return of tournament football to Gabon after just a five year gap would be welcomed, as the country tries to grow its burgeoning footballing culture. Pros: With two brand spanking new stadiums built in Libreville and Franceville in 2011, the edits to these two flagship arenas would be minimal. The Stade d’Angondje in Libreville and Stade de Franceville were built explicitly for AFCON 2012, proving more than adequate to host the games of Africa’s premier tournament. Furthermore, Gabon would seem more than big enough in terms of its tourist infrastructure to host the ascending crowds on the country. A growing tourist trade, attracted by its untouched national parks and possibility of citing gorillas, Gabon is used to non-Gabonese people being in and around the country and is able to cope as such. Plenty of beds were available in 2012, and one would assume that this will be the case again. Fundamentally, Gabon have a lot of money. They have a hell of a lot of oil, with President Ali Bongo the sort of guy that Issa Haayatou can really gel with. A general apparent lack of opposition to his rule means that the population aren’t likely to kick up a fuss, which should make for a nice, free-flowing tournament (in Cup of Nations terms at least). Cons: Whilst the co-hosting of the 2012 tournament went down a treat, with minimal issue when linking up with one of the most closed nations on the continent, the added burden of full hosting responsibility is one that should be of slight concern in terms of available infrastructure. Whilst the other two bids are basically ready to go, the Stade d’Angondje and Stade de Franceville are the only stadiums of note, having both been built prior to the 2012 Cup of Nations. One would assume that the other stadium in Libreville – the Augustin Modedan de Sibang (capacity of 7000) – and the Port Gentil stadium – Pierre Clavier Divonguy (capacity also of 7000) – would be the remaining two used. Not only will the small capacities possibly require some improvements, but CAF regulations specify that two stadia cannot be too close together when used as part of the same tournament. Whether or not this rules out the second Libreville stadium remains to be seen, and may see Bitam step up to the plate instead. However, if Equatorial Guinea can manage to revamp their stadiums in a month, one would assume Gabon could do it in two years. Another issue is the fact that they hosted it so recently. Whilst CAF could arguably justify Gabon hosting under the name of emergency hosts – given the relative lack of time they have to prepare – the competency of the other two bids means this may have a larger bearing on CAF’s collective mind. Background: Footballing hotbed and one of the most economically developed nations in Africa, Ghanaian football is what many people will automatically think about when they think about African football, with the large number of exports currently playing in Europe securing themselves as one of the best teams on the continent. Runners-up in Equatorial Guinea, they almost broke their duck when it came to performances at Africa Cup of Nations tournaments, with the trophy eluding them since 1982. Hosting in 2017 would be a great opportunity to have something to show for the nearly men of recent years. Pros: Much like Algeria, football is something that is very much present in the veins of Ghanaians all over. One of the most passionate in the press box, their national team is one of particular debate and discussion in African football, with squad announcements and results regularly dominating social media. With a very strong press presence there, you can be assured that the games will be well covered. The stadiums too are ready to be used, with the hosting in 2008 meaning that it is likely the same four will be used in 2017, after they were reconstructed for this event. The Accra and Kumasi stadiums in particular both have large capacities and would seem to be in good nick, with the distribution of cities across the country meaning everyone has the chance of getting to a game, from Tamale in the north to Sekondi-Takoradi in the south. 2008 was generally deemed to be a very well run tournament as well, with the reasonably good attendances, ease of getting around and atmosphere about the place providing some pleasant memories for all involved. Whether the CAF officials remember it as fondly remains to be seen. Cons: The population of Ghana is the main issue when it comes to Ghana’s bid, with many seeing this as a misplaced priority by the government, with the general feeling that funds could be better spent elsewhere. The economist Dr. Kofi Amoah has been one of those vocalising their displeasure, with the failure to use AFCON 2008 infrastructure to the benefit of the people since the tournament being of immense concern, as the lack of legacy since then suggest a lack of faith to use the resources to good use. Despite claims from sports minister Mahama Ayariga that hosting will not cripple the country in light of various economic challenges, there is the general feeling that people do not want AFCON to return to Ghana, after just a seven-year absence. Indeed, the country has hosted it on multiple occasions since the Africa Cup of Nations started, hosting in 1963 and 1978 as well as 2008, also co-hosting with Nigeria in 2000 after Zimbabwe were banned from hosting. This is something that CAF will presumably consider.